Today, I finished the show at the CAMA Conference at the Sheraton Centre in downtown Toronto. 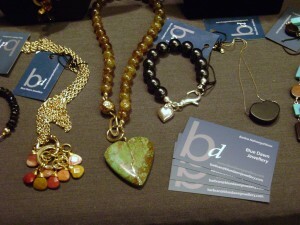 Lots of compliments about my jewellery – unique and original were words I heard often when people stopped at my booth to look and shop. Lots of people – lawyers, miners, consultants. Lots of people I haven’t seen for years. 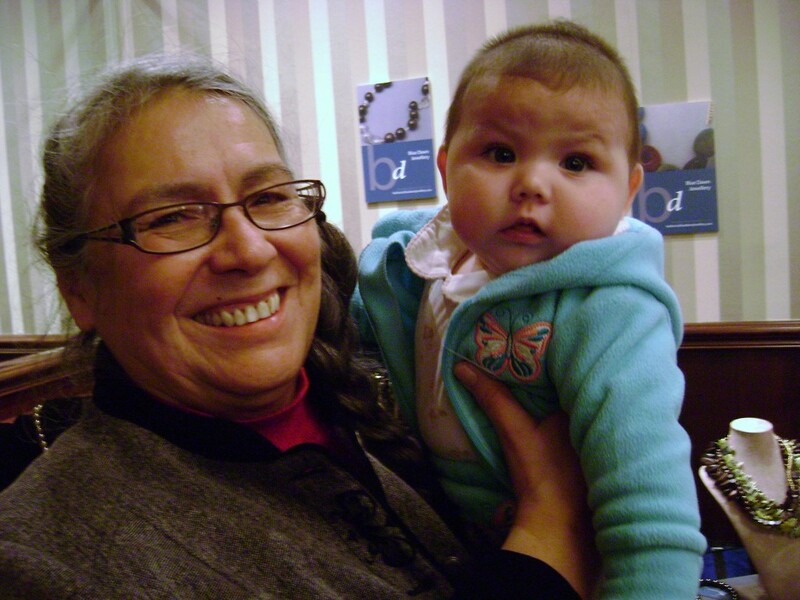 That’s Mariah, five months old with her Nokomis Carolyn. Mariah proves that you’re never too young to start accessorizing. Isn’t she gorgeous? So sweet too, and she laughed a lot. I’ve known her Nokomis for a very long time, maybe since high school. We worked together for a while in the Ontario Government, Native Community Branch and then lost touch, and I guess it’s been 20 years or so since I’ve seen her. Carolyn’s back at school studying for her doctorate at Laurentian University. Very impressive woman. Here is some of the work I was showing at the Conference. 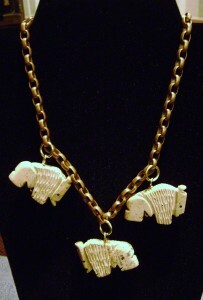 The Buffalo in the necklace above are hard-carved of Utah Marble and I’ve hung them on vintage brass chain. 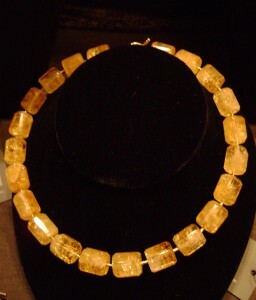 The necklace above the buffalo one is citrine with gold filled spacer beads and a gold-filled toggle clasp. 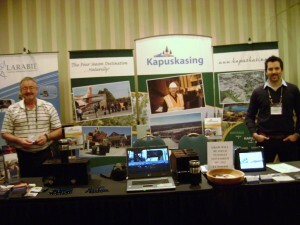 My neighbours at the CAMA conference were great guys from Kapuskasing. There were reps from the town of Kap as well as two brothers – Denis and Louis Larabie who own the Larabie consulting firm. That’s Louis on the left in the photo below. They were talking about snow! And we’re having such balmy weather in Toronto. Having great neighbours at a show is a must especially if you’re doing a show alone which I was. So thanks guys! I hope Louis’ wife liked the Peruvian Opal necklace he got for her. Off to do another show for the next two days. It was a pleasure being your neighbor and your artistry is remarkable. Yes, Lise is enjoying her necklace very much. All the best in 2013 to you too. I’m happy your wife is enjoying the necklace. Hi, We’re back in Toronto this year for our 25th Silver Anniversary Event at the Marriott Eaton Center November 12 – 13, would you be interested in again attending as a vendor? We’re so happy to see that your previous experience with the conference was a pleasant one!